This course provides an exploration of genuine contentment, the foundational views of the Buddhist teachings, and meditation in action for daily life. Through the gentle precision of meditation practice, we can learn to appreciate ourselves and simple human experiences, free from self-aggression. Difficult emotions and the challenges of life can be met with curiosity, steadiness, and humor. Each class includes a guided meditation and/or contemplation, a short talk or teaching, and time for a discussion about how the material relates to daily life. Please plan on attending each session of the program. The first and last classes are especially important. 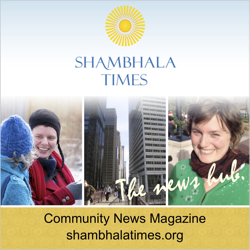 Contentment in Everyday Life is the second of the five weekly courses that accompany the Shambhala Training programs. It is recommended either before or after Shambhala Training II, but Contentment in Everyday Life can be taken on its own.